Insects that are the least bit social may gather in modest groups, like the dozen or so sawfly larvae feeding on a pine needle, or they may form huge masses, like a swarm of migratory locusts in Africa or a cloud of mayflies at the edge of a midwestern lake or river. Why these insects get together and what they get out of their associations are questions finely and fully considered in this learned and entertaining look at the group behavior and social lives of a wide array of bugs. The groups that Gilbert Waldbauer discusses here are not as complex or tightly organized as the better-known societies of termites, wasps, ants, and bees. Some, like the mayflies, come together merely because they emerge from the water in the same place at the same time. But others, like swarms of locusts, are loosely organized, the individual insects congregating to migrate together for distances of hundreds of miles. And yet others form a simple cooperative society, such as the colony of tent caterpillars that weaves a silken tent to house the whole group. 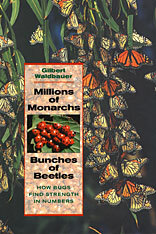 Waldbauer tells us how individuals in these and other insect aggregations communicate (or don’t), how they coordinate their efforts, how some congregate the better to mate, how some groups improve the temperature and humidity of their microenvironment, and how others safeguard themselves (or the future of their kind) by amassing in such vast numbers as to confound predators. 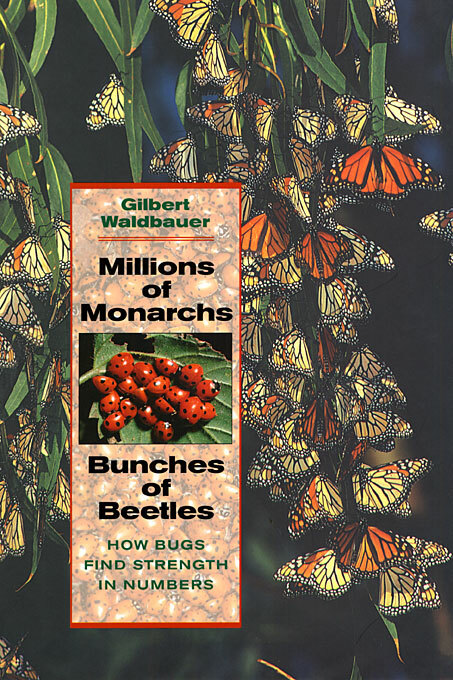 As engaging and authoritative as Waldbauer’s previous books, Millions of Monarchs, Bunches of Beetles will enlighten and delight those who know their insects well and those who wish to know them better.